What is the worst-case scenario for climate change? The geological record shows that when the atmosphere suddenly changes, there are big effects on living things. 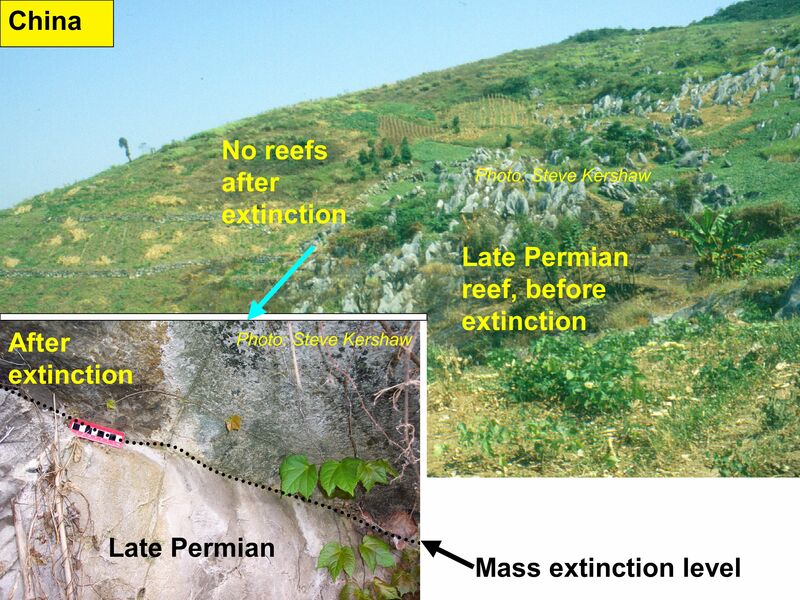 Five major mass extinction events are recorded in the rock record of the last 600 million years. The biggest extinction was at the end of the Permian, around 252 million years ago. It is called the End-Permian mass extinction. Only about 8% of species survived to live on in the Triassic Period. Chongqing Special Administrative Region (SAR) in central China, showing a hillside that includes rocks crossing the end-Permian extinction event and the Permian-Triassic boundary. Researchers have found evidence of a compound called fly ash, one of the products of coal combustion, in rocks laid down just before this extinction event. A large amount of coal had been burned over a period of tens of thousands of years. The coal was burned by volcanic eruptions that happened in Siberia, which produced a large area of volcanic rocks called the Siberian Traps. The burning actually happened underground, with the carbon dioxide and ash mixing with magma. Schematic of coal–basalt volcanism leading to mass extinction. This produced vast amounts of CO2 which warmed the Earth and changed the chemistry of the oceans.